Milwaukee County Sheriff David Clarke submitted his letter of resignation Thursday. Milwaukee County Sheriff David Clarke has resigned. Clarke rose to national prominence thanks to appearances on Fox News, where he often talked about police issues. He also supported President Donald Trump during the 2016 campaign due to Trump's strong views on law and order. But Clarke is a controversial figure and has faced scrutiny over management of the Milwaukee County Jail. Four people at the jail died over a six-month span last year. Those deaths include a newborn baby and a man who died of dehydration after spending seven days in solitary confinement without water. 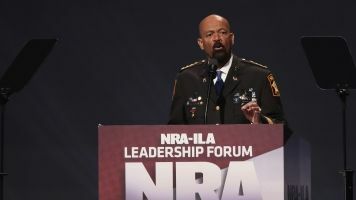 Clarke said in May that he'd be joining the Trump administration as a liaison at the Department of Homeland Security, but he later withdrew his name from consideration. According to Newsy's partners as WTMJ, Clarke's resignation will take effect at 11:59 p.m. Thursday. It wasn't immediately clear why Clarke was resigning.